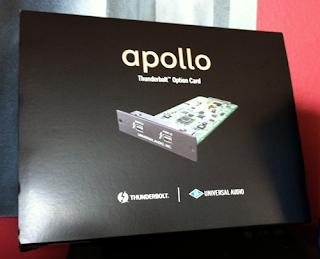 Thunderbolt arrives for the UAD Apollo – huzzah! There’s a lot of chippage going on in this little card. That means I can now use the fancy little Thunderbolt port on my Mac Book Pro instead of the Firewire 800 port. So much simpler – only three cables needed now. That means there are virtually no bandwidth limitations on the number of Apollo-hosted UAD plugins you can use. This wasn’t too much of a problem with Firewire anyway – unless you wanted to share your Firewire port with, say, an external hard drive. Which you tend to do quite a bit when you’re recording/mixing music. Thunderbolt gives way lower latency times than Firewire – I can now run Logic quite happily with a 32 sample buffer, (as long as my project isn’t too huge). It used to choke a bit before. I’ve also noticed Logic feels a little snappier and more responsive when starting/stopping playback, and the songs load and close slightly faster – perhaps due to the UAD plugins loading and unloading faster. Perhaps it’s just my imagination – further testing will reveal whether this is the case. I also haven’t taken the time to check out the higher sample rates yet. 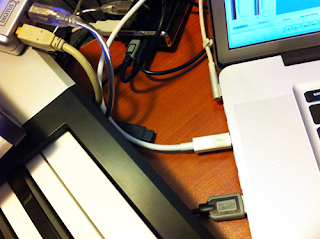 A cool thing about Thunderbolt is that it’s daisy-chainable (as is Firewire, by the way). But what I particularly like about it is that I can plug my laptop into the Apollo’s new Thunderbolt port, and then there’s still a second Thunderbolt port on the card which I can then plug into my studio’s LCD monitor – just using my usual laptop DVI-VGA adaptor. Magic. Even better – the two Firewire 800 ports on the back of the Apollo now become a Firewire hub, so one of the ports can now be plugged into my external Firewire hard drive – and it all goes through the Thunderbolt cable into my laptop. So that little skinny little Thunderbolt cable is handling audio going to and from the Apollo, UAD plugin data going to and from the Apollo, video being sent to my studio LED monitor, and data to and from my external hard drive. That’s a lot of stuff going on. For me, convenience is a big thing. I want a simple, tidy connection setup – especially as I use my laptop as my main studio computer and want to be able to come home and plug it into my studio setup with a minimum of fuss. As you can see, Thunderbolt does this really well. This was easy – unplug the Apollo’s power, use the included allen key to take the little slot cover off the back of the Apollo (make sure to remove any static from yourself), then slide in the Thunderbolt card. Put the screws back in. Plug the power back in, connect Thunderbolt cable and turn it on. Took about 2 minutes. It showed up in the computer exactly the same as before, but without the Firewire bandwidth meter and settings in the Apollo Control Panel. Note that you will have to update your UAD software and the firmware in the Apollo before fitting the card if you haven’t already (I had). You also can’t connect to your computer with Firewire AND Thunderbolt at the same time. It doesn’t like it, apparently. Expense. It’s currently about $700NZ for the interface card – I think that’s still a little over-priced, but perhaps the price will drop as they produce more of them. Thunderbolt cables are also a little expensive at the moment – $78NZ for a 2-metre cable. Ouch. Still – not as bad as the first Firewire cable I ever bought – that was $300NZ! Also – for those that didn’t go and check out the Thunderbolt links at the top – the cables are in part so expensive because they have circuitry in each of the connectors so they can combine (and then separate at the other end) the video and the data. Most people will probably find that the Apollo is just fine with the existing Firewire 800 option. Those who are pushing the limits of their setup all the time (like I am! ), or want ultra-low latencies for tracking, or who prefer a simple and tidy studio cabling setup, would definitely benefit from this Thunderbolt card. And as more and more Thunderbolt-compatible devices become available, the convenience of being able to daisy-chain all these devices together will be even more of a priority. It’s no secret I’ve been a fan of UAD since I purchased the little UAD-2 Solo/Laptop card. Since the Solo has only one of the SHARC plug-in processing chips in it, my plug-in demands quickly overloaded it. This was usually accompanied by the fiddly and annoying juggling of said plug-ins and bouncing or freezing of tracks in Logic. So when UAD’s Apollo emerged as their new flagship product, I was excited (and after 25-odd years in the music industry, I don’t get excited by much anymore). Not only did the Apollo come with some reputedly rather nice preamps, it contained either a Duo or Quad SHARC chipset for running UAD’s rather tasty plug-ins as well. Even better, you could have some of those UAD plug-ins in between those preamps and your DAW. This means you could have the virtual equivalent of a very expensive vintage tracking chain of effects with a usefully-low recording latency. That’s pretty damn cool. So I managed to get my hands on an Apollo Duo for a try-out (Thanks Leon at NZ Rockshop!) since all the Quads sold out instantly in NZ on hitting the shores. A big potential selling point for me was that the Apollo is supposed to be able to be fitted with Intel’s new Thunderbolt interface. (More here) This involves purchasing an extra add-on card which hasn’t been released yet at the time of publishing, but I really look forward to checking out the performance when these become available. The Thunderbolt transfer speeds are supposed to be blisteringly-fast – actually similar to connecting directly to the PCI-express port on your computer (and there’s two channels of that per Thunderbolt port). This means even lower latencies between the interface and the computer, with none of the Firewire-bus wrangling. This is really only an issue anyway if you have external Firewire drives daisy-chained to the Apollo. 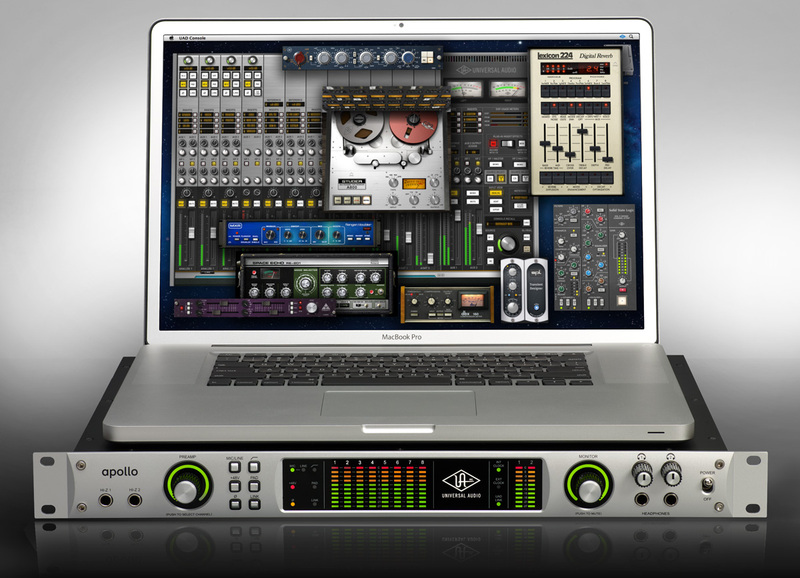 UAD have a solid reputation in the audio industry – they make great “vintage”- quality hardware, and have also pretty much nailed the “accurately-modelled vintage studio hardware” DAW plug-in market. I have found the UAD version of classic vintage units such as the Pultec and LA-2A to be several steps above other versions I have tried. They model each component of prized representative units of vintage hardware to capture all the non-linearity that made the originals so musical and desirable. Then they add any extra handy functions to make them slightly more usable in modern DAW production. As you can imagine, all this extremely detailed modelling takes a ridiculous amount of extra processing power – hence needing some heavy-duty plug-in engines to do all the hard work. This is why UAD plug-ins only run in UAD hardware (and no doubt also for copy-protection reasons). Although you can buy duo or quad-chipped UAD Firewire and internal PCIe units, the Apollo conveniently includes the chips in this tasty preamp/audio interface unit. The build on these units is solid. They are only one rack unit high, but are quite long. They are well-perforated for good ventilation, and the finish is impeccable. Simple front panel controls make operation easy, and probably help keep the cost down. Large gain and output volume knobs have an LED ring around them to indicate current level, and each has a push-switch included. For the gain knob, this selects between the four microphone preamps, and for the master volume knob, it is also a mute control. Power is supplied through a fairly chunky external power pack that handles the various international voltages. Despite all the digital gear packed around it, the analogue side remains completely silent and clear. The Burr-Brown preamps are very nice – high gain, quiet and very transparent. Luckily you can insert some UAD plug-ins between the preamps and the DAW inputs to colour this sound should you wish. In fact, as I hinted at earlier, this is one of the other major selling points of this unit – the ability to put a chain of UAD plugins in between your microphone, guitar or bass and the input of your DAW. For those of us that like to commit immediately to a particular sound, and can’t afford the luxury of racks of vintage analog gear, this is a godsend. Of course this is only useful if the recording latency is low enough to be usable, and in this case it is – only a couple of milliseconds in total. Saying that – there was still a little wrangling of monitor sources in the DAW to avoid the ol’ comb-filtering effect of two sources with different latencies. I look forward to seeing what the recording latency is like in the Thunderbolt-interface version of the unit when it becomes available. It means bringing it down to latencies that are very close to using the old Pro Tools HD hardware – less than 1 millisecond. That’s pretty darn good. Okay, so far everything looks pretty good – there’s not much to fault in this unit really. I would say that the only niggles are in the software/firmware. My first issue was with the combination of the Apollo and my old UAD-2 Solo/Laptop card. Since my trial Apollo unit was only a Duo, I thought, “ah, I’ve still got my little Solo/Laptop card as well, so that’s three processors – not too far off four”. While this was true in theory – it didn’t immediately work in practice. I discovered there are some “quirks” with laptop cards. Cardslots in general have always been a little quirky – although in theory it’s fine to hot-plug certain devices into the guts of a computer while it’s running (and the Solo/Laptop by itself usually seemed to handle it okay) – it’s really pushing the technology/software/OS towards their limits. I found that with the combination of the two devices, I was getting some UAD plug-in overload messages opening up old Logic sessions with UAD plugs inserted. Anyway – the friendly and patient support guy at Universal Audio helped me troubleshoot it on the phone, and it turns out that as long as the Solo/Laptop card is plugged-in before booting up the laptop (so it shows up first in the hardware list in the UAD Control Panel), and then the Apollo is plugged in/turned on afterwards, everything works just dandy. Any loaded UAD plug-ins in the session are now distributed over all the available SHARC chips. Sorted. Another minor annoyance I found was with the implementation of the plug-ins within the Console app – you can’t drag and drop the plug-ins into a different order – you have to cut and paste etc. A bit fiddly when you’re wearing a guitar and trying to quickly get something tracked while the idea’s hot. 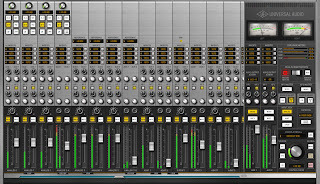 The Console plug-in is modelled on an analog console, with its own built-in effects sends and returns and headphone sends. It allows some nice low-latency patching of monitoring effects like reverb and delay, but it doesn’t include the more obvious ability to patch any input to any output like most audio interface mixer apps. This is offset somewhat by each of the various ins/outs within the Console app showing up in your DAW as ins/outs, but is not what you would call “conventional” or transparent operation. Especially if trying to set up multiple headphone sends, each with a different mix. There’s no beat-clock for UAD effects that depend on session tempo either – I can see why this is difficult to include as the Console app sits external to your DAW session – but perhaps having the facility to accept MIDI clock via a virtual MIDI port would be valuable. (UAD boffins – maybe this could be implemented via the Console plug-in?) Having beat-synced delays is important whilst tracking to a song with delay-based effects. I’d also like to see the ability to map MIDI controllers to various Console parameters/UAD plug-in parameters. It’s not all niggles though – there’s a handy plug-in version of the Console for remembering the settings as part of your project – nice! And the Console app allows the easy copy/pasting of your channel mix settings to your effects/headphone sends – very handy! Sound quality; I couldn’t fault it. This is a very nice unit. Very low noise and no obvious colouration in the mic preamps. Plenty of gain. Full 48 V Phantom power for mics. Pad, low cut and phase switches. All controlled by a fancy rotating knob with surrounding lit ring showing current gain, and some selector buttons. I tried recording and playback at various sample rates up to 192kHz. I didn’t find that much difference between them really. Just correspondingly lower latency and perhaps a touch more “silkiness” on some instruments in the higher frequencies. I’m guessing the Apollo oversamples for the lower sample rates anyway, so there’s not much in it. 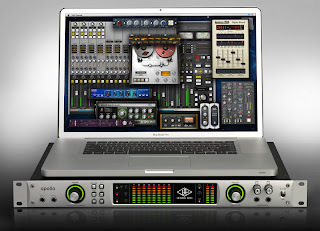 (And some of the UAD plug-ins themselves are upsampled as well). I tried recording some acoustic guitar – first without any UAD plug-ins inserted – the preamps sounded open and clean-sounding. Very transparent and very low noise. About what I expected from UAD. Very nice. 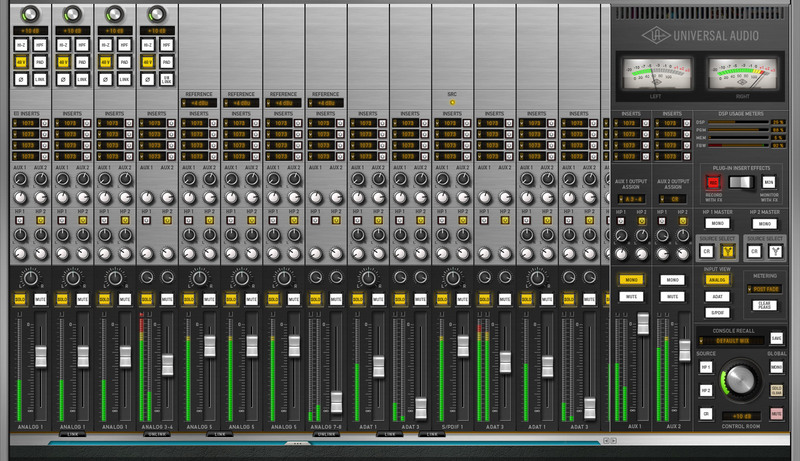 I then tried inserting some plug-ins into the Console app that comes with the Apollo. Some gentle compression with the 1176SE, Pultec adding small amount of top, and LA3A as peak limiter. Beautiful – now the guitar was sounding shiny and firm, with no nasty artifacts, and no noticeable noise problems despite the compression. I had to pull the fader down in Logic and just monitor through the UAD console app to avoid the latency-induced comb-filtering. Next I thought I’d try one of the High-impedance instrument inputs on the Apollo’s front panel. The input automatically switches from Mic/Line to Instrument when you plug in. Handy. Oh – and it sounds really good. I’m not suprised – UA has an excellent reputation with not only audio quality, but also pro-level usability design. As I’m guilty of pretty much always just plugging my Fender Jag-Stang straight into my interface to capture ideas as fast as possible – I could tell that this immediately sounded better than my old interface ever did. A LOT better. Winding the gain knob up gave a really nice creamy analogue distortion too. I’m really liking this unit so far. Clean on mic inputs, nicely coloured analogue on the Hi-Z inputs. Let’s try the dodgy acoustic guitar piezo bridge pickup. Plugging straight into the Hi-Z jack. Wow – same thing again. A huge improvement – in fact the best I’ve heard it sound from the pickup. It’s normally quite clicky and overly percussive. This sounds much smoother and fatter. And my Jaguar bass sounds great plugged straight into the Hi-Z input as well – as much as I love my old Drawmer 1960 tube preamp on bass, I have much more control with the Apollo. So – it seems like we’re getting 4 very good quality mic preamps with this unit. The mic inputs can be switched to the line inputs on the back, with the first two inputs automatically switching to Instrument when something is plugged into the Hi-Z jacks in the front. There’s also the usual S/PDIF I/O (with auto sample rate conversion if you like), and an S-Muxed dual ADAT I/O that can do either 8 channels of regular 44.1 or 48kHz sample rates or handle up to 4 channels of 192kHz audio. There’s two headphone outputs that can be fed from various parts of the Console app. The controls are simple and clear – each of the four preamp inputs can be selected by pressing the gain knob, and rotating to set amount of gain. A circular light ring surrounding the gain pot shows the amount of gain added. Switches apply 48v Phantom Power, Pad, high-pass filter etc to the selected channel. The Console app shows much more detail, reading out in decibels and showing the state of everything all at once. It has its own built-in headphone busses and effects monitoring setup. Because this is a digitally-controlled preamp, all settings may be saved and recalled – as I mentioned, there is a Console plug-in (in all the typical plug-in formats) that can be inserted into the session that can recall all these settings automatically if you like. A great unit overall. Sounds fantastic and is, without doubt, value for money – especially the Quad version. Not quite perfect yet – there’s still a few very minor things to iron out with the interface software, and the Thunderbolt adaptor is still absent (as at July 2012). For this price (about USD$2,500 or just under NZD$4,000), the question is why woudn’t you buy one. ps. I forgot to mention, for those of you who know little about UAD yet; like most of their plug-in based devices, the Apollo comes standard with the UAD-2 Analog Classics plugins collection (the 1176LN, LA-2A and PultecEQP-1A) and a voucher for $100 worth of plugins. That’s pretty cool value – especially if you wait until one of their fairly regular online sales to use it. Plus – when you install your plug-ins, it installs every UAD plug-in, and the others (that you haven’t purchased yet) can be demoed for two weeks from whenever you click the little “demo” button on the plug-in. I’ve also noticed that all the demos seem to be reset every time you purchase a new plug-in. These guys are very canny yet professional with their marketing, and they certainly know how to look after their customers.